This vibration-resistant Gravitymaster watch features twin sensor technology allowing the user to quickly check direction and temperature from the thermometer and compass features making it the ideal watch for all explorers. 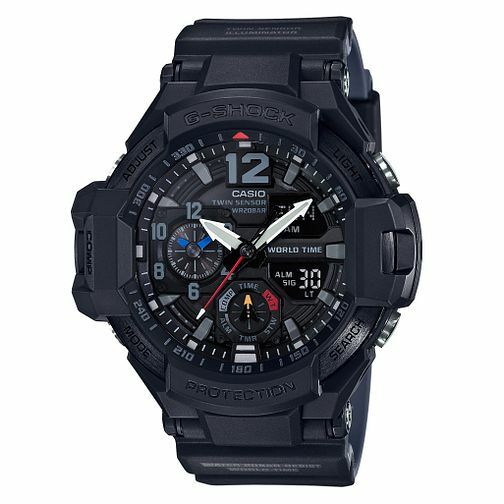 Casio G-Shock Men's Gravitymaster Shock Resistant Watch is rated 4.5 out of 5 by 2. Rated 4 out of 5 by Anonymous from Gravitymaster I’ve loved the G-Shock range for many years. I’m a sound engineer and required a robusted watch for work. Since having this watch it has taken a few knocks on flight cases and heavy equipment and it hasn’t taken any damage/scratches whereas my Apple Watch had scratches and a lot of near misses from a cracked screen.